Whenever we ride some form of public transportation, how often do we think of the people who operate the vehicles, be they buses, subways, trams, commuter trains, etc? We may have concerns when there are delays or, worse, the occasional accident, but most of the time we get on board with nary a worry about the person behind the wheel or at the controls. Perhaps in small towns or medium-sized cities the residents have a chance to get to know the drivers or conductors, but I would wager that in New York City – with a population of greater than 8 million – those folks are, for most people, but passing faces in the crowd. 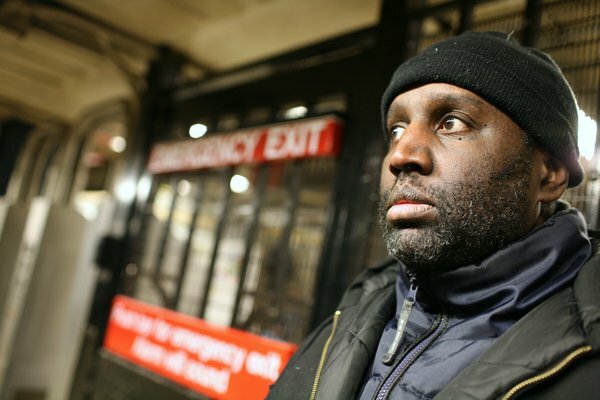 How unnerving would it be, then, to know that, since the 1980s, a public “transit bandit” named Darius McCollum has periodically snuck on to New York’s subway cars and buses and impersonated MTA personnel? That’s right, time and time again, Mr. McCollum has donned stolen uniforms, boarded vehicles, and driven them along their official routes, only to be eventually discovered, exposed as an imposter and arrested. Here’s the thing, though, and the key to what makes Off the Rails, the debut feature-length documentary from filmmaker Adam Irving, so fascinating: each and every time, McCollum has operated the trains or buses without deviation from their scheduled itineraries, frequently doing as good a job – if not better – than do legitimate MTA employees. What’s his agenda, then? Darius McCollum, as we learn, is someone whose personality and behavior place him somewhere on the Asperger’s side of the autism spectrum disorder scale. In the film, he is described as a “person with Asperger’s,” but since the language of how to refer to people with autism is still in flux, I’ll refrain from overly deterministic descriptions of McCollum’s cognitive issues. What is clear is that McCollum derives enormous comfort from rigorous schedules and their implementation. When he was a child, some trauma at school led him to take refuge in the world of New York’s subway system, where he became popular with the train engineers and conductors as an unofficial apprentice. An extremely intelligent child, he quickly learned the transit routines, so much so that he was allowed to operate the trains under increasingly lighter supervision by his nominal mentors. Why, then, is he not employed by the MTA? To answer that would give away too much of this wonderfully insightful and powerful look at what can happen to a man when the system fails him. In great detail, interviewing legal experts and psychologists, as well as McCollum, himself, Off the Rails examines the thirty-year-plus tragic journey of an individual whose life-coping mechanism consistently leads him into mischief. One cannot but wonder, watching the film, why more cannot be done to help McCollum, who is a nonviolent offender often placed in the same prison wards with violent psychopaths. Even if we have legitimate concerns about what could go wrong on one of McCollum’s many illegitimate mass-transit joyrides (perhaps the wrong term when every journey is marked by an absence of drama), is the proper response to throw him in jail, yet again? He needs therapy, not prison. Beautifully photographed and expertly edited, Irving’s film raises essential questions of our collective responsibility towards troubled individuals, all the while telling a highly entertaining story that mixes thrills, comedy and drama in equal measure.